One afternoon last summer, as she listened to Dr. John DeFlaminis tell eight educators how he was going to transform their schools with distributed leadership teams, Danielle Brown felt a surge of adrenaline. This is what effective schools do, Brown remembers thinking. She had worked at such schools before, but not since moving to the York City School District to become principal of the McKinley K–8 School. Brown saw educators in York working hard, but not together, to serve their students. That’s why DeFlaminis, a prophet of distributed leadership in education and executive director of Penn GSE’s Penn Center for Educational Leadership (PCEL), was called in. York, a city of 44,000 two hours west of Philadelphia, was once a manufacturing powerhouse. They made Peppermint Patties, Caterpillar engines, and barbells here. But the factories have largely closed. Despite an arts-driven downtown renaissance, poverty is high and jobs are scarce in many neighborhoods. In 2014, a fiscal crisis in the district and poor academic performance moved a state-appointed officer to ask a judge for the power to close York public schools and convert many of them to charters. That plan fizzled, but the underlying problems remained. “It was a crisis,” says York City Superintendent Eric Holmes. District administrators and leaders of the teachers union wanted to come up with their own plan for improving schools before another one could be forced upon them. Then they learned of DeFlaminis, and distributed leadership. The concept of distributed leadership sounds simple: Rather than rule from the top, a principal creates a team with four to six teachers. They assess problems together, figuring out the needs of the students and the school, and the best way to address those needs. Eventually, each team member has his or her own team, so that leadership extends throughout the school. Advocates of this approach believe it improves schools in a sustainable way and leads to better student performance. By drawing on the leadership capabilities of professionals across the school, the institution maximizes its resources and puts its future into the hands of its entire staff, not just one leader whose departure could spell the end of key initiatives. In practice, distributed leadership can be hard. People have egos, and power can be difficult to give up. But DeFlaminis has a track record of helping schools—many with too many students and not enough money—find the path. Together, the York City administration and the teachers union decided to bring DeFlaminis to York, in what may be the district’s last best hope of avoiding a radical overhaul. DeFlaminis started with an intensive two-week workshop for prospective teams in the summer of 2015. He has coaching sessions with the teams every month, and has brought in others from Penn GSE and PCEL, such as Professor Jonathan Supovitz; Dr. Harris Sokoloff, executive director of the Center for School Study Councils and the Penn Project for Civic Engagement; Dr. Bonnie Botel-Sheppard, GED’76, GRD’81, executive director of the Penn Literacy Network (PLN); Joseph Ginotti, director of PLN; and Professor Emeritus Charles Dwyer. PCEL’s Dr. Jim O’Toole has been assistant director of all distributed leadership projects. Teachers had to apply to be on the teams. The district was overwhelmed with applications. “There was a thirst to be involved and shake off the previous doubts about what was going to happen to the district,” Holmes says. DeFlaminis discovered the value of distributed leadership firsthand. He was sitting in his office in 1987, deep in another 100-hour week as the new superintendent of the Radnor Township School District, when he realized taking the job might have been a horrible mistake. He arrived at the suburban Philadelphia district after a decade leading two intermediate units. He had a Ph.D. from the University of Oregon in educational administration. He understood educational theory. He understood how it worked in practice. And he understood he was drowning. 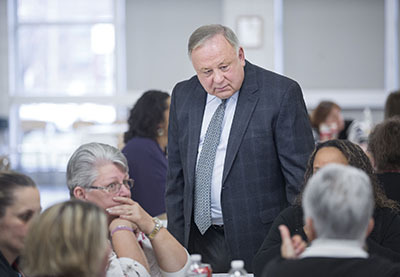 DeFlaminis recognized that working singlehandedly wouldn’t help him solve the district’s complex problems; he would have to start thinking about leadership as a shared endeavor. He had four openings on his staff. With each hire, he found someone with skills or experience he lacked. Then he started empowering his staffers. Decision-making making in Radnor became a communal process. “If I was going to survive, I was going to have to give away leadership,” he says. “We were going to have to work as a team.” After a few years, principals in the district started to copy his model. The philosophy that guided his seventeen years as superintendent emerged. After arriving at Penn GSE in 2004, he heard Northwestern University researcher James Spillane give a lecture on his study of Chicago schools that were empowering teachers as leaders. Spillane’s results on what he called distributed leadership backed up DeFlaminis’s experiences. DeFlaminis soon began designing a program for teaching distributed leadership in Philadelphia schools that the Annenberg Foundation would support with a $5-million grant. Around the same time, Linda Carroll became principal at Northeast, the largest high school in Philadelphia. Looking around the school, she was overwhelmed, exactly as DeFlaminis once felt. Structures weren’t in place to support students, and the communication between teachers and administration was rarely productive. Carroll heard DeFlaminis would be helping sixteen city schools create distributed leadership teams. She wanted in. “People had to change the way they thought about the institution and become more accountable,” Carroll says. DeFlaminis coached Carroll’s team in hard skills, like data management, and soft ones, like trust. It took time, but Carroll and her team were able to transform how decisions were made at Northeast. Teachers determined the types of professional development they needed, and the best way to receive it. Student performance improved, and so did staff morale. Spillane believes DeFlaminis’s distributed leadership program should be considered the gold standard. “He knows the skills people need, and he’s found ways to give people those skills,” Spillane says. The results stick. Years after DeFlaminis’s hands-on coaching ended, distributed leadership remains Northeast’s bedrock. The system helped keep the school afloat, Carroll says, when the worst of the budget cuts hit and Northeast was receiving an allocation of just $5 per student. In the decade since the school adopted distributed leadership, only one teacher has requested a transfer out of Northeast, a turnover rate almost unheard of in Philadelphia. “We still have so many people here because of the culture we created,” Carroll says. The Northeast story gives leaders in York hope. Like in urban districts elsewhere, many of the best new teachers leave York for the surrounding suburbs after gaining a few years of experience. “If people felt like they were part of the process, maybe we wouldn’t have lost so many promising teachers,” Holmes says. Across Pennsylvania, school districts in other small cities are feeling similar financial pressures and staring at similarly low test scores and graduation rates. Parents and educators have heard talk about interventions and turnaround models. Cities around the country have tried the kinds of solutions originally proposed for York. Some succeeded. Some continued to struggle. DeFlaminis’s work in York is still in its early stages. It takes a year to eighteen months for teams to really get a feel for what they are doing, and even longer for the culture to change within schools. A concurrent curriculum overhaul, which DeFlaminis is also involved in, will be crucial. Real results are still to come. But people are watching what’s happening in York. If distributed leadership can change the course of the district, it might be a model for other troubled districts. It should be, according to Carroll. This story was originally published in the Spring 2016 edition of the Penn GSE Alumni Magazine.